You guys are all seeing the Internet hoopla about “The Dress” aren’t you? For those that aren’t, you should so you can join in on the conversation. Here ya go: check it out. See? Now, let’s say it all together. What colors is the dress? Wait, what?! I know some of you guys aren’t like Jas and ACTUALLY see white and gold? What’s the matter with you? The Dress is blue and black; blue and black, I tell you! This actually sparked a debate in my house last night; me and Ashley stand by the assertion that the dress is blue and black. Jas and my mom are convinced it’s white and gold. We were split right down the middle. I just couldn’t see it. I didn’t understand. It was a mystery. But apparently the whole thing boils down to the ability of the cones in our eye retinas to mix and process colors through out brains. The people that see blue and black have cones that are better able to do this; people that see white and gold have cones that are…different. But in all fairness, since last night I have taken another couple looks at the picture (this is all over social media by now so it’s kind of impossible not to) and I will admit: if I try really, really, REALLY hard…then I can see the dress as white and gold. It’s like mentally flicking a light switch on in my brain and literally ‘forcing’ myself to see white and gold. It only lasts for a few seconds, but it does work. Honestly it reminds me of one of those optical illusion pictures where there are actually two drawings within one and depending on whether or not you’re left brained or right brained, you see one or the other. My first instinct with this dress will always make me see blue and black, but if I try to, then I can see white and gold. I was getting to that. See, this post has been in my Posts folder on the WordPress dashboard for nearly a month. I’ve been purposely passing it over in favor of other recipes and at one point, considered deleting it altogether. It’s not that this is a bad recipe; it’s actually delicious. The problem was I just didn’t like the way the pictures turned out. Or at least most times, I didn’t. Photographing brown food is really hard, guys. If you have crap lighting, then forget about; it’s not gonna work. But even under the best lighting circumstances imaginable, there’s still the risk that the dish you’re shooting will turn out looking…not appetizing. I did what I could to prevent this from happening; including other colors,making sure my sauce was fresh and shiny and sticky, and creating texture with sesame seeds…but when it was all said and done I still wasn’t sure. At one point, I would look at these pictures and think that the meatballs looked good. Then the next day I’d look at them and think they looked like…. But today I feel like they don’t look too shabby. And considering I DID put in the work in cooking and photographing them, I figure I’d make it worthwhile and just put the friggin post up regardless. You guys be the judge. Just think of it like The Dress photo; give it a few tries and see if you can see things differently than my more negative/self-depreciating side. Let me know if it works. And if it doesn’t, then do me a favor: don’t feel obligated to point it out. Just don’t tell me. Deal? Oh yeah and Happy Fiesta Friday #57 at The Novice Gardener. 1. Make the meatballs: Preheat the oven to 400 degrees F and line a baking sheet with parchment paper. Heat 1 tablespoon vegetable oil in a large nonstick skillet over medium-high heat. Add the cabbage and season with 1/4 teaspoon salt; cook, stirring occasionally, until softened, about 4 minutes. Transfer the cabbage to a plate to cool. 2. Wipe out the pan, then add the remaining 1 tablespoon vegetable oil and the mushrooms. Season with 1/4 teaspoon salt and a few grinds of pepper and cook, stirring occasionally, until lightly browned, about 5 minutes. Transfer the mushrooms to the plate with the cabbage to cool. 3. Lightly beat the eggs and egg white in a large bowl. Add the pork, scallions, garlic, ginger, soy sauce, sesame oil, sugar and cornstarch. Add the cabbage, mushrooms and a few grinds of pepper and mix with your hands until just combined (do not overmix). 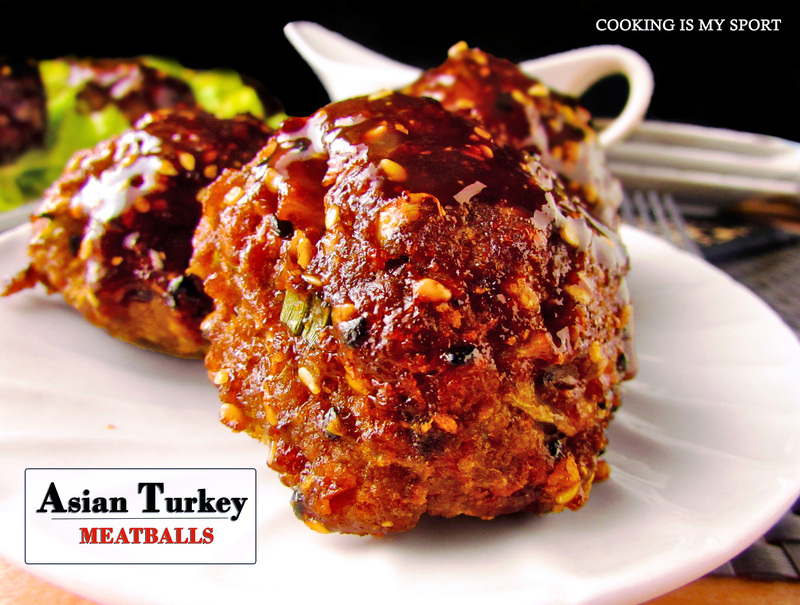 Dampen your hands and shape the meat mixture into 18 balls (about 2 inches each); arrange on the prepared baking sheet. 4. Make the sauce: Mix the hoisin sauce, Sriracha, vinegar, sugar and 1 tablespoon water in a bowl; set aside 1/2 cup for serving. 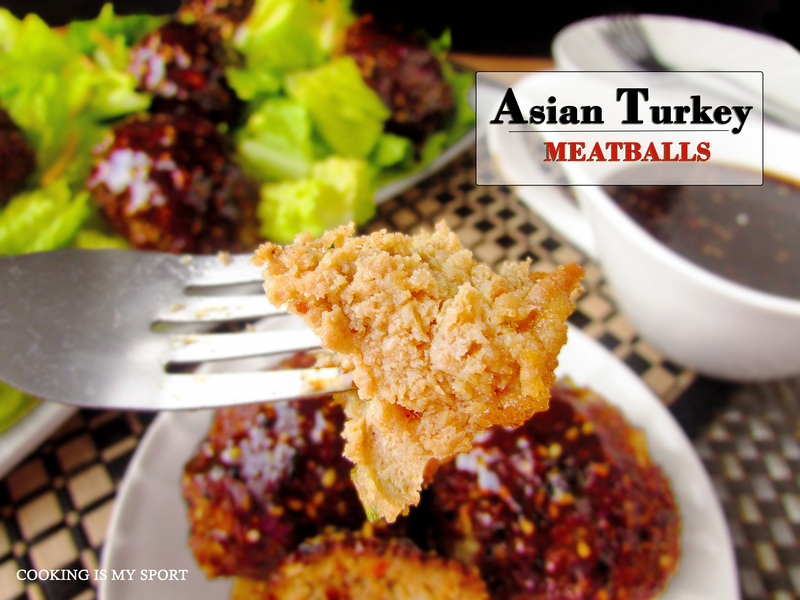 Brush the meatballs with the remaining sauce and sprinkle with the sesame seeds. Bake until cooked through, 18 to 22 minutes. Serve in lettuce leaves with the reserved sauce. White and gold for me! Though my husband SWEARS it’s blue and gold! How is that possible? Now I know why his clothes never match unless I pick them out…heheh. Your post cracked me up! At 11:00 last night my daughter texts me a picture, and says what color do you think this dress is? I didn’t know what she was talking about, but after watching the news today, I do. I’m afraid to tell you what I saw because it isn’t one of the 2 choices. I saw light blue and gold! Not sure I want to know what this means! :( Anyway, I hope you will still think it a compliment if I say I think your pictures look great. I wish I had some of those meatballs in front of me right now. Also, just to let you know you’re not the only one, I feel the exact same way about the pictures on my post today. It was such a great recipe, though, I posted it anyway, but cringe every time I look at them. Thanks for letting me know that I’m not the only one who feels that way, Jess, and thanks for a great recipe! Yes, it’s all over social media Jess, what’s the fuss I ask? :)). I can’t imagine why you kept these meatballs hidden for so long. The pictures are gorgeous dressed up with the green lettuce, I love the glaze, the shine, the colors…. but you’re right, I guess I never thought brown food looked so bad in pictures. However, most of our winter foods are brown aren’t they? :). 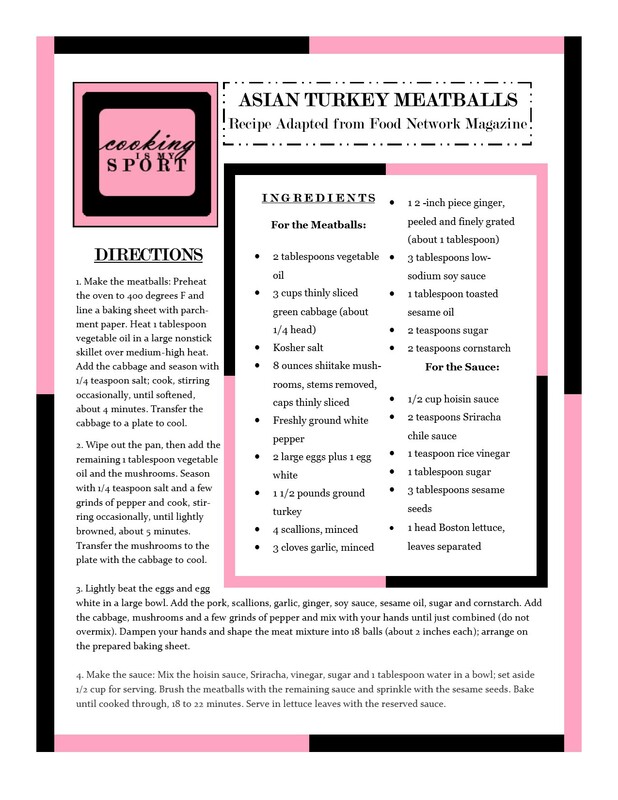 I love the ingredients, and I always stick with turkey too, so much healthier. Thanks Loretta, that means a lot to hear you say that. Today’s actually one of those days when I’m not so ‘sure’ about them. It depends on which picture I look at, I think – but your meatballs look definitely moreish! TRUE Ginger; I’ve looked at pictures that have had the light altered where they make the dress look white and gold…but it IS blue and black. Thank you! Nah, you’re not weird Amanda. Light blue and gold is meeting me halfway, so I’m good with that lol Thank you! It’s definitely white and gold for me! My husband sees blue and black and it has been driving us crazy!! These meatballs are making my stomach grumble and I work through the last few hours of the day. I heart hoisin sauce so I know that these must be absolutely decadent and delicious 🙂 Hope you have a great weekend Jess! 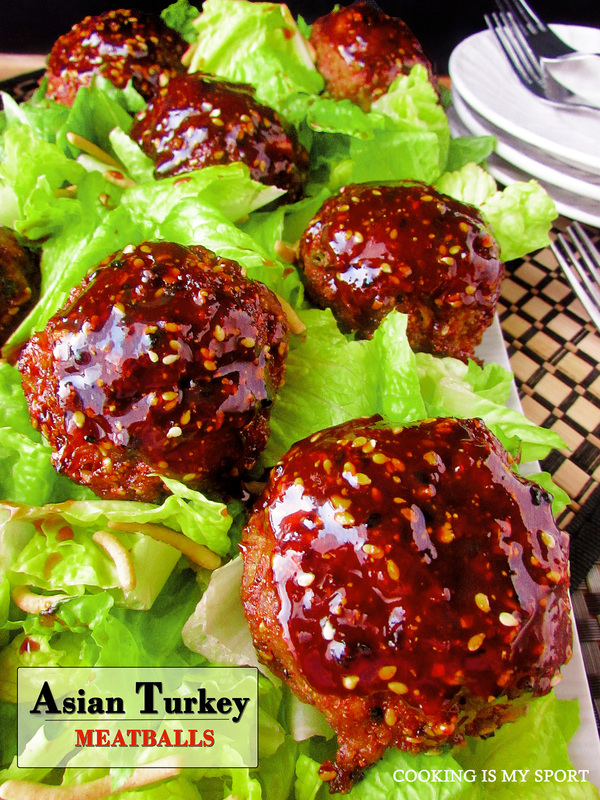 I am kind of obsessed with Asian flavors right now and seeing your meatballs makes me really hungry. They sounds delicious and I think my Gyoza and your meatballs would make an excellent combination. The sauce sounds wonderful!!! I saw blue and black as well! No idea how anyone can see white and gold. I just don’t get it, it’s mental! The only way I can imagine people seeing white and gold is if they’re looking at one of the ‘altered’ pics I’ve seen floating around the internet. Thanks Alice! I am not bothered by pretty pictures of food .. More your excitement !! Much better! Thank you for explaining the dress debate, I keep seeing it and have no idea what it’s about!!! I thought these look delicious. And with all that sticky sauce, I know I’m bound to like it. Thanks for sharing it at Fiesta Friday! I saw white and gold, but that makes sense since I have terrible eye sight! Every now and then I’ll see a light blue and gold, but never ever black! I get what you mean about not wanting to post a recipe before of the photos, happens to me all the time! I’m glad you did though because these look yummy! Weird but the first time I saw it white and gold. That evening blue and black. My eyes are really whacked! Not when it comes to these meat balls though. They look so saucy delicious! I’m sure yours are just as good Julianna. I’d love to see your recipe- thank you! Wooow! 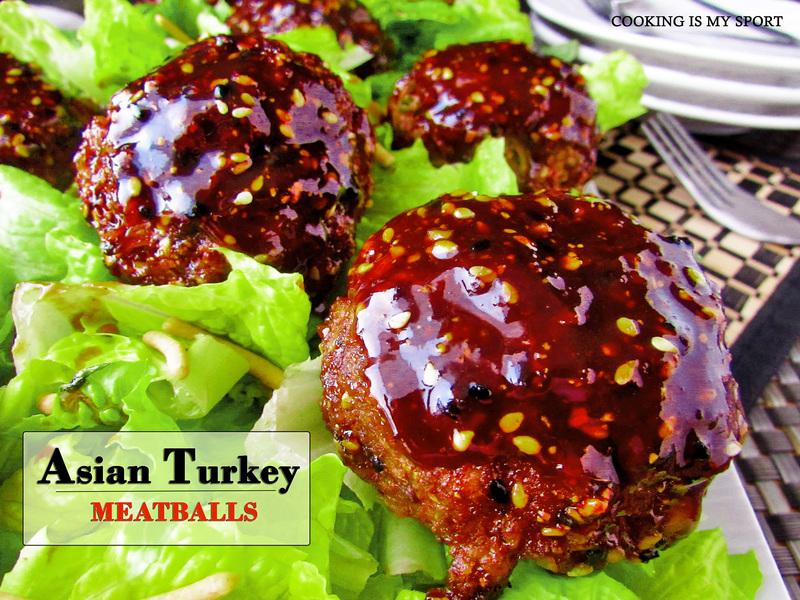 These meatballs look very tempting, especially the sauce. Wow, these sound so good! Dontcha just love it when looking at food makes you even more hungry? Story of my life, I swear. Thank you Lili! Love the theme of your blog- very clever, sets you apart on first impression from all the foodie blogs. As for these meatballs- SO CREATIVE! 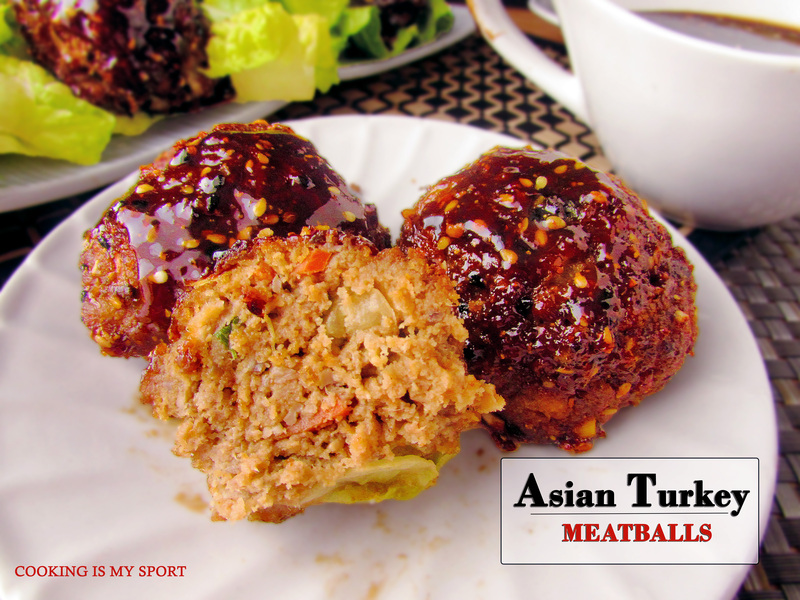 I’m all for recipes that twist your standard meatball (I blame too many mornings with Rachel ray) but this looks so unique flavor-wise. Touch down. Disclaimer: I have no background in sports and my references may very well be totally irrelevant. Your wonderful compliment just made my day, just so you know. Blue and black??? For me it’s light blue and gold!!! LOL!. Could we discuss of this item in front of your amazing and super yummy meatballs??? Honestly the color looks good to me, but still if you’re not happy with the final result I will be more than happy to look after these babies 😀 they look yummy!